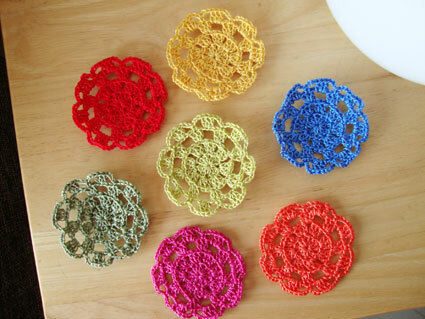 I took the pattern of these cute flowers from this lovely book that is a must-have ! I recommend it! You can order a copy from here. 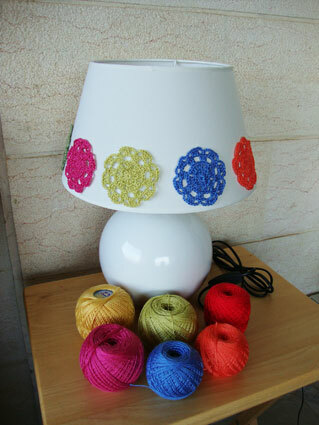 Hope you liked my transformed new lampshade! Have a happy happy happy week end! on October 22, 2010 at 9:13 am | Reply Rachel D.
This is a great ideia! So beautiful!! this looks very, very beautiful. I bought this book also and always find some nice ideas. I absolutely LOVE that “after”! How ideal, for someone who adores color (as do I) to find a perfectly shaped blank canvas, so to speak, to work with! I have that book too, and love it. You did a marvelous job, and I know you must be tickled pink every time you look at that lamp! It’s a great idea! Very personal lamp. I need this book, aixxx. So cute! I love what you did to it. I would be singing too if I had that lampshade! 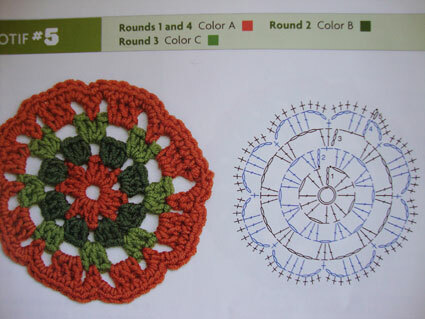 It’s a blank canvas screaming for crochet embellishment. Wow! That lampshade looks great! Great work! many, many thanks for your comment on my blog, I was very pleased. 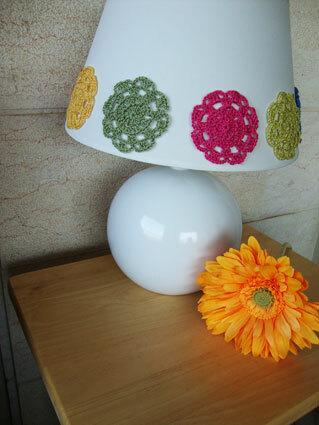 Love, love, love your lampshade. 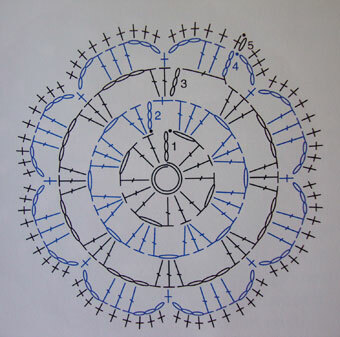 Silly question but how did you attach the motifs to the shade – did you use glue?? Such a modern, fresh and vibrant look now to the lamp. What an innovative idea. Just amazing. Hello! 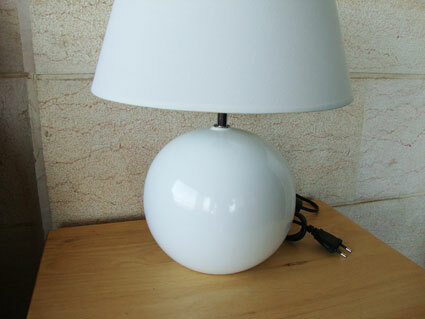 Your new lamp is beautiful! 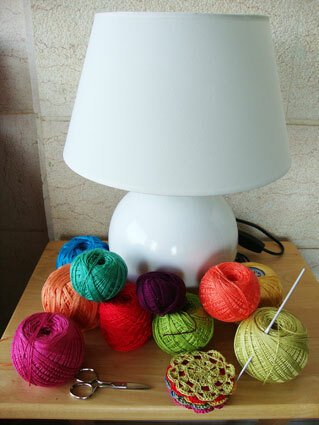 I have made last summer 50 tiny flowers for a lamp… but the lamp is still missing. 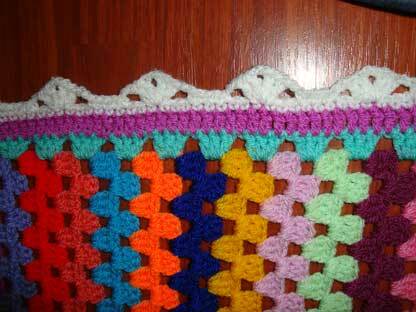 The granny blanket is going to be wonderful! 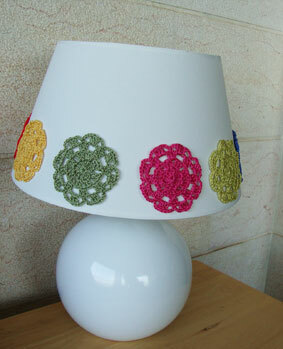 That is such a clever way to ‘pimp’ your lampshade. Really like the way you did this, with nice bright colours. And I agree with you on the book; it really is great and a huge source for inspiration! Thank you so much! I Have been looking for a motif to sew on to my daughters curtains – this is perfect! 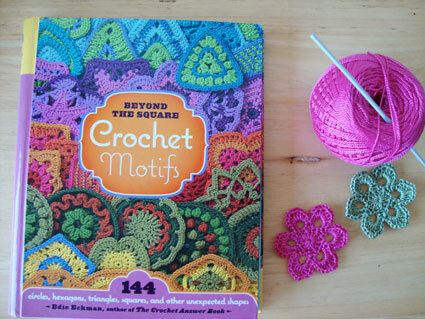 I shall have to get me this book! I have both of her books and love them! Your work is lovely-thanks so much for sharing!